With the announcement at SEMA this week by Ford of their twin-turbo drag-racing Mustang, it’s time to remember that Ford looked at a twin-turbo production 5 liter engine once before. Not for off-road use like the drag racing Mustang, but for regular production use in the F-150 as a way of meeting emissions and mileage standards while producing exceptional power and towing capacity. Meet the Ford Bobcat project, first shown in 2009. The code-name Bobcat engine is a very high-compression 5 liter modular V-8 with twin turbos and an unusual gasoline/E85 fuel system. The primary fuel system is port-injected gasoline. The Bobcat also uses a secondary direct injection system to inject varying amounts of ethanol directly into the combustion chamber, producing 500 horsepower and 750 pounds-feet of torque. All while meeting emissions and mileage targets. Twin top-mounted air-to-water intercoolers are also provided. The objective of the project was to produce diesel-like torque and power from a gasoline engine, without the complexity and cost. The ethanol is stored in a second gas tank with a 10-gallon capacity. The drawback to the project was the ethanol itself. With ethanol projects bankrolled by Congress, with special political and financial considerations to farmers and refiners, ethanol initially looked good. However, even in 2009 the writing was on the wall that eventually ethanol would have to fall out of political favor and that heavy subsidies to farmers and producers would eventually end. And while Bobcat programming would vary the amount of ethanol depending on load, heavy towing and long trips would require very frequent ethanol fill-ups. From a pure ethanol fueling infrastructure that did not exist. If ethanol wasn’t available, the engine would only be able to produced reduced power. So while the Bobcat engineering was solid, real-world practicalities eliminated any possibility of production. The project was ultimately shelved in favor of the EcoBoost V-6 engine and a longer-term weight reduction program. 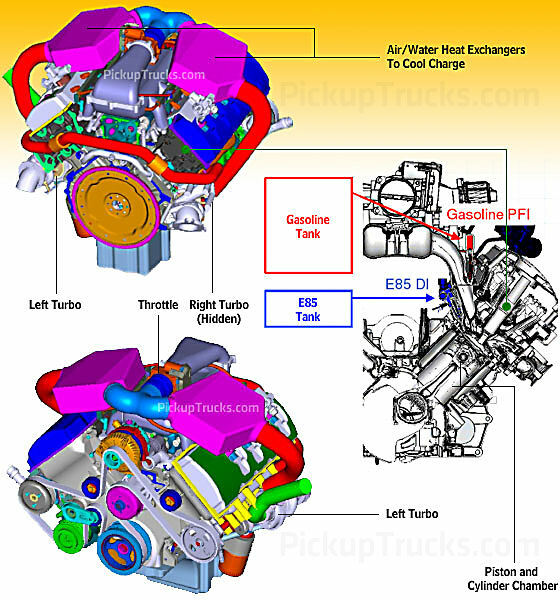 As readers in 2012 know, the EcoBoost program has been a phenomenal success and a very clear differentiator for Ford.